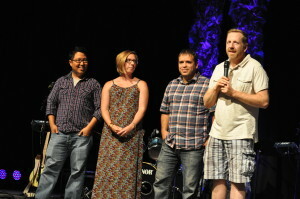 Jeff Bogue, pastor of Grace Church, Bath Campus, Akron, Ohio, right, introduces Peter Yoo and Juan Carlos and Emily Téllez during the national conference of the Fellowship of Grace Brethren Churches. Peter Yoo knows that tension quite intimately. As a second-generation Korean-American, Yoo ministered in Shanghai, China, for the past three years, until he and his wife, Anna, decided to embark on a new project: reaching the international community in Atlanta, Ga., for Christ. 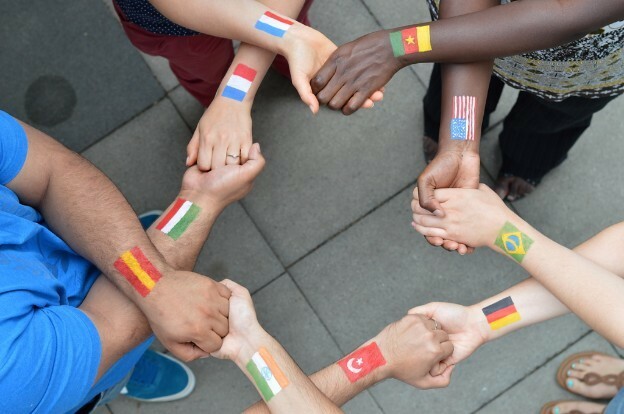 The idea was sparked when Dave Guiles, executive director at Encompass World Partners, and his team started praying about the need to reach the international community in Atlanta. The result was a fusion of three organizations: Grace Church of Greater Akron, Ohio (Jeff Bogue, senior pastor), Encompass World Partners, and the Grace Brethren Investment Foundation came together to finance the project and uphold it in prayer. Fusion seems to be the theme of the entire project. The word certainly describes the team that is currently being built – all with the acute understanding of the struggles and joys of those who grow up with parents who left everything to start over somewhere else. So far, along with the Yoo family, Columbian-American Juan Carlos Téllez and his Canadian-American wife, Emily, have joined the initiative. The Téllez’ have spent the last 11 years in Indiana, and two years before that in Honduras. The entire time they have been preparing for ministry wherever God called them. The plan is for the team of pastors to spend five months at the Akron church before being sent out to Atlanta this December. Once they make the move, the first year will be focused on growing the community of team leaders into a community of believers, and after that, a movement of churches. Send a note of encouragement to the Téllez family at jctellez@graceohio.org, and the Yoo family at peteryoo@graceohio.org.